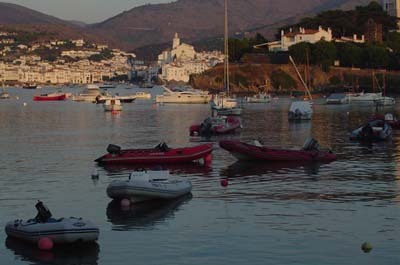 There are a couple of companies that hire out RIBs (Rigid Inflatable Boats) in Cadaques. You can hire these out by the hour, half day or day. Don't worry if you do not have a Masters licence, as you will be able to rent out the least powerful version with a driving licence (and this is still fine to potter around the bay and even to round the headland to the north and head off to Port Ligat or to some of the secluded bays along the coast). Head along the road by the Sea heading south. There's normally a temporary wooden sales office just before you get to the bay with the church behind. If you have a Masters licence, you'll be able to trade up to the faster boats with the bigger engines- you'll be able to explore most of the Cap de Creus coastline in one of these. We recommend taking a picnic and an ice cooler with some cold drinks, and heading out of the bay and rounding the headland past Port Ligat. Hole up in one of the beautiful empty bays, drop anchor and indulge in a 2 hour Catalan lunch! RIBs for Rent in Cadaques (Rigid Inflatable Boats). We rented from this company- a very friendly family owned business. A 5m RIB cost €200 for half a day with a €500 deposit.